This document describes how to fit a pod filter into your factory airbox to keep hot air from the engine bay from being drawn into the pod. Thereâ€™s lots of talk about different pod filter setups and there is a way you can box yours up in the factory box to maintain a stock appearance. This can be done using all stock parts with nothing more needed to be bought then the pod filter itself. However, if you own an EL you will need the top EF Airbox lid or get some PVC piping of your own. 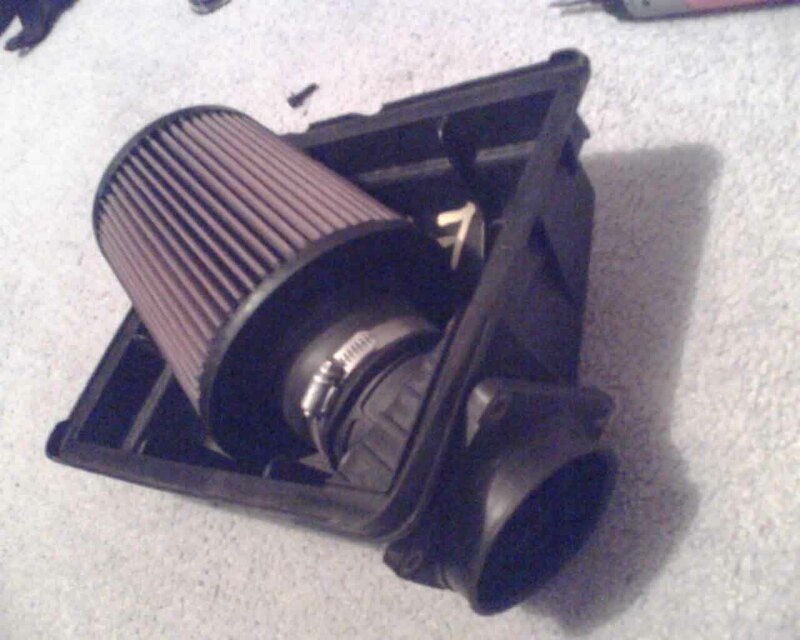 Pod Filters can be bought from any major auto stores. Just make sure itâ€™s to suit a 3-inch pipe or fits inside the box. Most K&Ns should fit and are the recommended brand. 1: Unclip and remove top part of air box, chuck you standard air filter aside. 2: Unbolt the 4 bolts on the tube that goes through the box, they are located on the outside. (The corner one might be a bit annoying - I got it off with some pliers instead.) Once they are unbolted you can remove the inner tube. 3: Cut the tube you've removed about half size using the tin snips, if itâ€™s too short for the pod to fit properly you can cut further down later. 4: Now put the tube youâ€™ve just cut back into the box, and bolt it in so it stays in place. 5: Now here's the fun part. Fit the pod filter over the air box tube inside the box. It may be a bit annoying but keep pushing it in until itâ€™s on completely on the tube, with no gaps. If you're having trouble fitting the pod in the box, pull it up ways to tilt it. If this doesn't work, you might have to cut the tube a bit shorter. 6: Tighten the clamp on the pod filter so itâ€™s nice and tight on the tube, so it won't be able to move. Alternatively you can put two screws through to hold it firmly in place. 7: Almost done! You've now got a boxed pod filter. Take the top part back to your car, put it on, clip it down and crank the engine to hear the sweet sounding filter. If you have trouble getting the box to clip in with the bottom part of the box or the intake tube, you may have to repeat step 5 to make sure the four bolts are completely down and flat. Document written by: lukey on 10 2007>, Copyright © 2007 lukey, all rights reserved.